Gilbert John Green was born in Malling in Kent in 1922, the son of George and Gladys Green. His family were from Southall in Middlesex, and he went to school there and was also a member of a local Air Cadet squadron. He was known to family and friends by the nickname Jimmy. 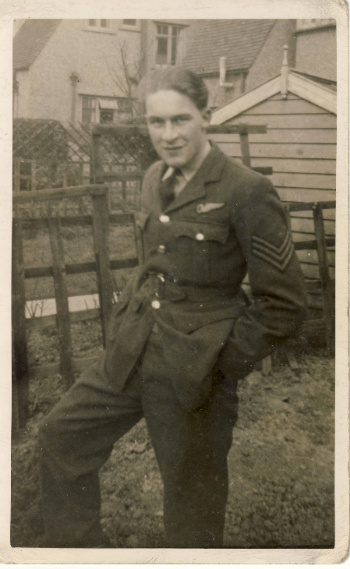 Green joined the RAF in 1941 and qualified as a bomb aimer in 1942. He was then posted to 25 Operational Training Unit, where he crewed up with Cyril Anderson and the core of the crew who would later fly on the Dams Raid. They moved on to 1654 Conversion Unit, where the whole crew was formed up. After their trip on the Dams Raid, the Anderson crew returned to 49 Squadron and resumed their operational career with an attack on Krefeld on 21 June. Altogether, they flew on 14 more operations in 49 Squadron, but on 23 September they failed to return from a successful attack on Mannheim. As they headed home, their aircraft was shot down by a night fighter near Offenbach. The bodies of five of the crew were recovered from the wreckage and were buried by the local Catholic priest Fr Jacob Storck on 26 September. Green and one other unidentified member of the crew were thrown from the wreckage by the explosion. Fr Storck said afterwards that they may have tried to bail out, although this has not been verified. Their bodies were not found until after the others, and the pair were buried in Offenbach Cemetery on 28 September, two days after the other five. After the war the bodies of all seven were exhumed and identified, and then reburied in Rheinberg War Cemetery.